Why consider biogas to Renewable Natural Gas (RNG)? First, there’s the momentum nationally and internationally on RNG (aka, biomethane, R-gas, green gas, renewable gas). Plus, biomethane is a flexible renewable fuel; and can be used in vehicle fuel, electricity, thermal, CHP, bio-product feedstock. Moreover, we can use the existing natural gas grid and fueling infrastructure, achieve the clean air benefits of transportation fuel switching which are strong, and capitalize on current policy shift globally to de-carbonize energy and the economy. 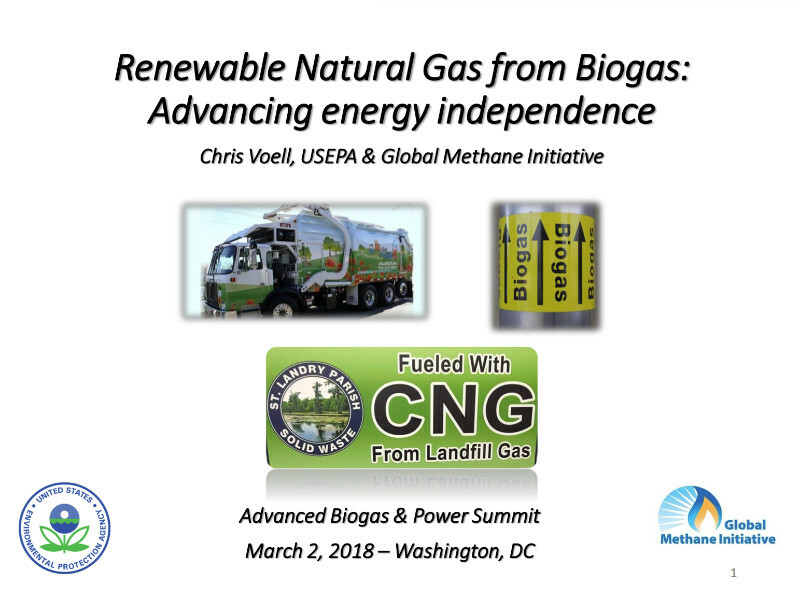 The EPA’s Chris Voell gave this illuminating overview on the Global Methane Initiative and much more at ABLC 2018 in Washington DC.